Let’s make a toast! 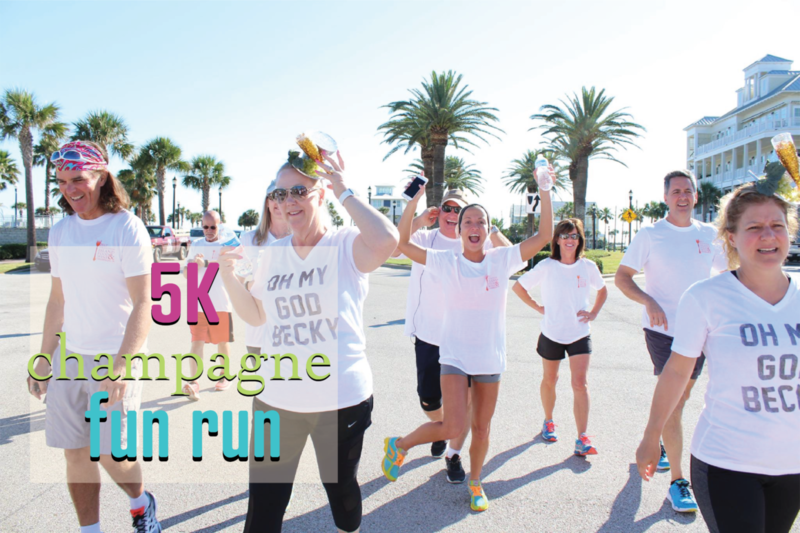 May your day be filled with fun times and many many bubbles at the 4th annual Galveston Island Wine Festival Champagne 5k! Our scenic, “there and back” route allows runners to enjoy the many sights and sounds of the Gulf as they make their way along the Galveston Island seawall. Once the finish line is crossed, the champagne celebration begins! Enjoy delicious bubbly from your commemorative 2019 Wine Fest wine glass! Chose the 5k + Grand Tasting option to join the folks downtown where you will sample exciting wines from around the world and nibble on a variety of small bites with big flavor, created by some of the most well-known and skillful chefs in the area! PRICES INCREASE APRIL 15TH @ 12AM! For discount rate, tickets must be purchased by 11:59pm on April 14th. This ticket option includes a fun festival tank top, a novelty festival wine glass, two free beers (Michelob Ultra)- one at Runner’s Happy Hour (packet pickup on April 26th), another after the 5k at Beerfoot Brewery, 1 free Bloody Mary at Blvd. Seafood, plus the champagne! (Two glasses of bubbly per runner at Beerfoot Brewery, post-run). This option also provides a GA ticket to The Grand Tasting Event at Wine Fest! This ticket option includes a fun festival tank top, a novelty festival wine glass, two free beers (Michelob Ultra)- one at Runner’s Happy Hour (packet pickup on April 26th) and another after the 5k at Beerfoot Brewery, and 1 free Bloody Mary at Blvd. Seafood! Starting & Finishing across from Beerfoot Brewery on Galveston’s quaint little island seawall, this 5K Fun Run consists of an easy “there and back” route, with a celebratory champagne drink once you cross the finish line! The Champagne 5k will not be officially timed and there will be no medals awarded to top finishers. The event is organized as an all-ages fun run/walk. However, there will be a run clock set up at the start/finish line, so that those of you who wish to time yourselves, may do so.